UK Release Date - 3rd February 1983. US Release Date - 28th February 1983. Special Formats - Limited Edition (500 copies) 7 Inch Pop-Up Camera sleeve (VERP5). Special Formats - Limited Edition 7 Inch Pop-Up Camera sleeve with different Marilyn Monroe pic (VERQ5). Photography - Paul Cox (Band). Photography - Adrian Boot (Cover). Marilyn Monroe Lookalike Model - Kay Kent (Died in June 1989/also in the promo video). The first single from 'Pyromania' was released in February 1983. 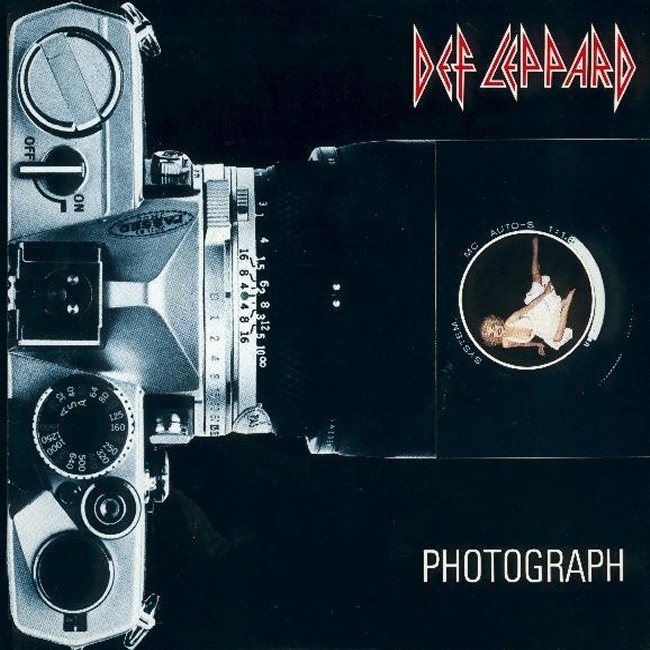 'Photograph' was the first single issued featuring Phil Collen on guitar. It also featured backing guitars by former guitarist Pete Willis. The song did not reach the UK Top 40, peaking at number 66. In the US it gave the band their first major hit single, getting to number 12. The first time a Leppard single reached the Top 20. In the UK a Limited Edition 7" was issued of just 500 copies. It had a "Pop-Up" camera sleeve. After opening up the sleeve looking through the camera revealed a picture of Marilyn Monroe. The main 7" sleeve showed a small pic of Marilyn and a large camera. The reverse side was plain black, song titles in white writing and a promo pic at the top showing the band in the London Docklands. As with all singles from this album, no new songs were used as B-Sides. All contained album tracks from 'Pyromania' or 'High 'n' Dry'.